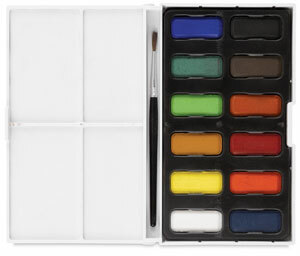 Reeves Watercolor Pan Sets are ideal for scholastic users in the older grades or for adult beginners. They provide quality color at an economical price. Twelve half-pan watercolors in a convenient, pocket-sized, white plastic box. The box has a hinged lid that doubles as a palette. Colors include White, Light Yellow, Yellow, Green, Light Green, Blue, Violet, Orange, Red, Burnt Sienna, Black, Burnt Umber.